Why can't I attach a document to my email? How do I clear formatting? Why is a parent not receiving my emails? How do I know if an email address is bouncing? My is a teacher not receiving my emails? What can recipients do to ensure they receive our email? There are a number of reasons attaching files to bulk emails can cause problems. Many ISPs and end-users block emails above a certain size. Attachments can increase the size of your email raising the risk of your email getting blocked. Most content and virus scanning programs see attachments sent through any bulk mailing service as a potential security threat, and either block the attachment or the email entirely. So a majority of attachments may not reach your subscribers. Sending a copy of your file to each recipient would take a lot of bandwidth, which can get pretty expensive. Having you link to files hosted in your free www.dropbox.com account help keep costs down and our pricing reasonable. Linking to files instead of allowing attachments helps keep costs down and helps delivery rates, which means a win for everyone. You may find when copying and pasting text from another source such as Word or Google Docs that the format is not the same. This happens because you are pasting non-HTML text into the HTML editor and it's not able to translate the format. The simplest way to solve this problem is to clear the formatting in your text and then reformat the way you wish. Select all the the text and then Click the Clear Formatting button in the top row, far right. Once you've cleared your formatting select the font size, color, etc. that you wish and then save. Unsubscribed: The parent has unsubscribed themselves from receiving general email. 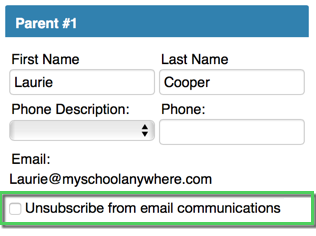 To see if a parent has unsubscribed go to People / Families and click on the Parents tab. Put in the parent's name and search. You'll see a Yes in the Unsub column. You can edit the family and go to the parent info to uncheck. Note: Unsubscribing only prevents General email from being sent. Online Access and Data Confirmation Email will still be received by parents who have unsubscribed from General Email. Bounced Email: The email may be bouncing, meaning the email address domain they've provided is blocking the message from being delivered. Read "How do I know if an email address is bouncing?" SPAM: A parent has marked a previous email as SPAM. You can check for this by reviewing the Email History Log, filtering by the parent's email address. When a parent marks an email as SPAM, they are added to a do-not-mail list. When this happens, please contact the sender first to ensure that it wasn't done in error. Then contact MySchoolAnywhere. We can clear a parent's email address from the spam report one time. However, please know our email reputation is damaged each time we are reported as spam. Bounced: the email was not delivered - you should remove this email from the parent record. Soft bounce: this means the email is good but could not be delivered. The parent may have on a spam catcher to stop emails. You should try to contact the parent via a personal email to see if you can get a new email. Rejected: the email account no longer exists or had bad syntax. Remove the email from the parent record. Email sent from your MySchoolAnywhere system can occassionally be rejected or misfiled due to 'unknown sender'. To prevent this, have your administration advise your community to add mail@myschoolanywheremail.com to their safe sender list. This practice is called 'white listing'. You can also direct parents and faculty to read the following detailed article for step-by-step instructions. This can be found in the Parent Support Center: I'm not receiving email. What can I do? Why is a teacher not receiving my emails? If you see that the emails were delivered via the history log then it means that they are being blocked or rejected by their email server. Some schools or school districts required a unique code to be put in the subject line specifically for faculty to ensure delivery. For example: at one school they had to use the initials of the school district in the subject or the email would be blocked and not delivered.